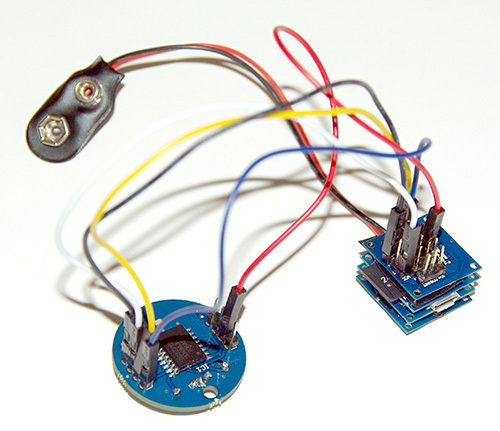 I thought it might be good to put a few words in here on working with the Tinyduino system, because, although I really love the small footprint, and power optimization, you could say they were a “trial by fire” for someone with basic soldering skills. 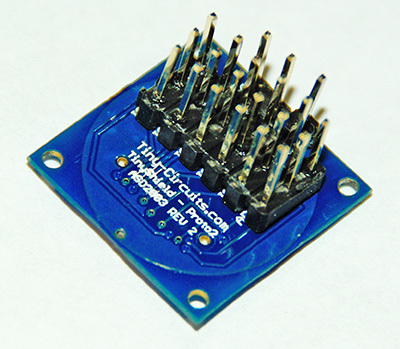 Initially, I took one of their protoboards and added three rows of jumper pins to connect my RTC. This appeared to go ok so I painstakingly did this to all the proto-boards I had on hand. But while it all seemed to go pretty well at first, I just could not get the darned RTC to work reliably. I labored long under the assumption that I was making mistakes in the code (which hey, I probably was), or I had not pulled up the I2C bus properly, or there was something else I just had not learned yet. I eventually discovered that the tiny protoboard was slowly bending under the force of the jumper wires themselves, loosing contact with the stack, or shorting out on the layer below ( I did not have spacers in place to prevent this). And even when I fixed that, I still had weird intermittent faults occurring. Nothing is more frustrating than something that works fine most of the time, but then randomly cuts out on you. In the end it turned out to be bridging between those really small contacts. I must have done it when I was soldering the pins on, but even after really close inspection, I could not see the bridge anywhere. I ordered more boards, and started soldering thinner wires directly on, but then the wires themselves started breaking, because they were so fragile. I eventually figured out how to add some extra “support solder” by folding the wires over into a bit of ‘J’ hook, but even then they still couldn’t take much jostling around. Now, I know there’s plenty of people out there just waiting to post a comment like: “If you are not already working with surface mount, just go home rookie”. 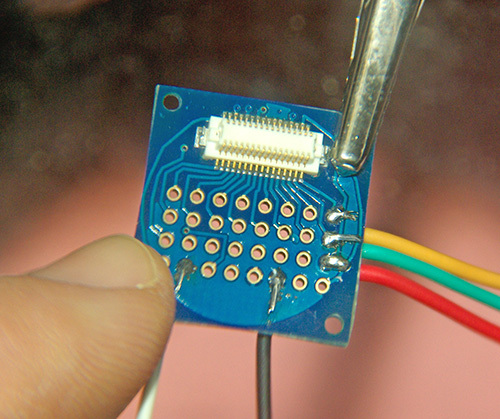 But I made this project blog in the hope that it might help other folks get rolling, so if, unlike me, you still have all your hair: do yourself a favor and buy a really good temperature controlled soldering iron, with ultra fine points in ‘mint’ condition. And I would recommend a fair bit of soldering practice, with a solder wick, before you jump in on those 0.1 inch Tinyduino proto-boards. Even then, buy extras, because you are probably going to go through them much faster than you think. I know I did. And you don’t need to replicate my errors here any more because Tiny-Circuits has released an extended protoboard that you can buy naked for $5, or with terminal blocks! These let you place the extension board in the middle of the tinyduino stack & with all that extra space, I have soldered of riser pins on dozens of those new “double-wide” proto boards without any problems. Also I now use soft multi-strand test lead wire with silicone insulation (instead of stiff PVC), which dramatically reduces strain on the solder joints. This entry was posted in Lessons learned. on February 5, 2014 by edmallon.